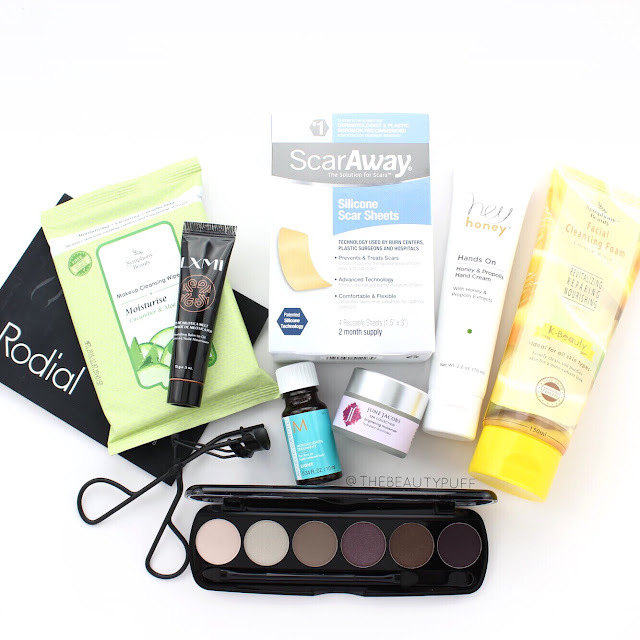 It's time for July's NewBeauty TestTube! If you aren't familiar with NewBeauty TestTube, it is a beauty sampling program that includes both full and deluxe size samples of must-have beauty products. It's a great mix of makeup, skincare and haircare. I always feel so pampered with these TestTubes! Let's see what this month included. Beauty Tool | Jersey Shore Cosmetics Eyelash Curler ($30) for the perfect curl every time. Each curler comes with a replacement silicone pad. Skincare | LXMI Pure Nilotica Melt (Sample, full size $48) is a balm to oil formula that hydrates instantly and can be used on the face as well as lips. Rodial Snake Neck Mask (Sample, full size $65) gives the neck a firmer appearance in just 30 minutes with ingredients like syn-ake dipeptide and wheat protein. Hey Honey Hand Cream ($14) combines propolis, honey and shea butter to treat and keep hands smooth with each use. Symphony Beauty Facial Cleansing Foam and Cleansing Wipes ($10 ea) are the perfect combination for refreshed, cleansed skin this summer. Key ingredients include retinol and vitamin E. June Jacobs Brightening Moisturizer (sample, full size $85) contains lactic acid to aid in cell renewal and keep skin moisturized. It's a great way to brighten your complexion without the need for makeup. Makeup | Skinn Cosmetics Patina Eyeshadow ($22.50) is a beautiful palette featuring talc-free shadows in beautiful plum hues for day or night. Key ingredients include jojoba oil and retinol to fight fine lines on the eye area. Haircare | Moroccanoil Treatment Light (Sample, full size $44) has to be my favorite product this month. This sample may look small, but I've been working on another one for quite a while and it lasts forever! It just takes a small amount to smooth, de-frizz and add shine to my hair. The perfect finishing touch especially on second day hair! Treatment | Scaraway Silicone Scar Sheets ($9.99) help fade both new and old scars in a flexible, clear silicone sheet that can be cut to size. Silicone is the top scar-fighting ingredient, I never knew that!